Kiichiro Toyoda, the founder and former president of Toyota Motor Corporation, has been inducted into the Automotive Hall of Fame, cited for his extraordinary vision and entrepreneurial spirit. Toyoda is credited with expanding the Toyoda Automatic Loom Works, a successful business created by his father, Sakichi Toyoda, to take it into the world of automotive manufacturing in 1933. He served as president of Toyota Motor Corporation from 1941 to 1950 and his technical skills and leadership laid the foundations of a company that would grow to become one of the most respected businesses in the world. “Kiichiro Toyoda embodied the foresight and innovation that few people in history possess, demonstrated by his significant contributions to the automotive industry. We are honoured to include him in the 2018 induction class to the Automotive Hall of Fame,” said Ramzi Hermiz, chairman of the Automotive Hall of Fame. The induction ceremony took place in Detroit on 19 July and was attended by TMC executives including chairman of the board Takeshi Uchiyamada (right of opening image), who accepted the award on behalf of the company and the Toyoda family. “America was a special place for Kiichiro. He was amazed by the prevalence of automobiles driving around US cities in the late 1920s, and that was the catalyst for his determination to establish an automotive industry in his home country. 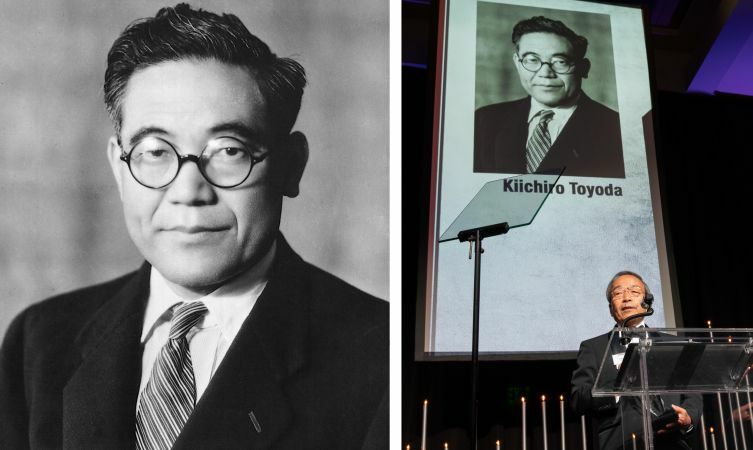 As a successor and his grandson, I am very grateful and proud that Kiichiro has been inducted into the Automotive Hall of Fame in America,” said Akio Toyoda, Toyota Motor Corporation President. “Kiichiro boldly changed Toyota’s business model from automatic looms to automobiles without being constrained by previous successes. As his induction comes at a time when our industry is facing profound changes, I believe his message today would be to work hard to help the industry revolutionise the future of mobility, even if success is not immediate. I deeply appreciate the Automotive Hall of Fame for inducting my grandfather and our founder,” he added. 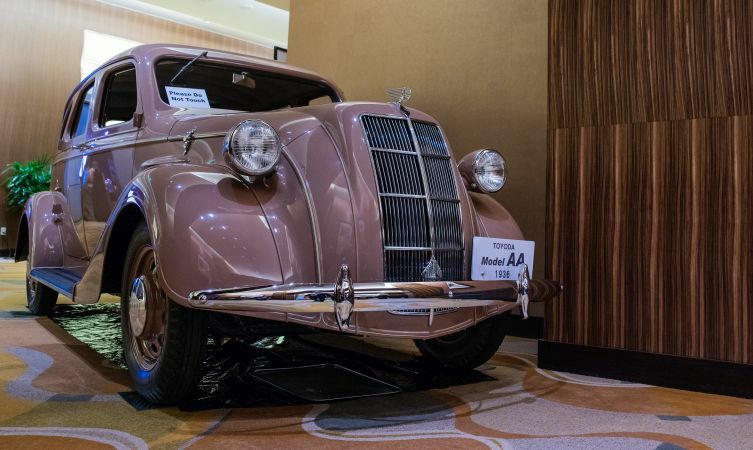 A replica of a 1936 Toyoda Model AA car was featured at the induction, on loan from the Petersen Automotive Museum in Los Angeles. The AA was the company’s first production passenger vehicle and was designed and manufactured under the guidance of Kiichiro Toyoda. Waste-free and efficiency-focused production techniques were used, including the famous just-in-time concept, paving the way for the world-renowned Toyota Production System. The Automotive Hall of Fame tells the stories of those who have made outstanding contributions to the automotive industry. It has honoured almost 800 men and women from around the world.